2 oz. 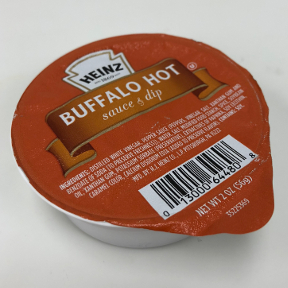 Buffalo Hot sauce & dip cup. Individual size for travel or lunch box. Take it along to spice up your food. Ingredients: Distilled White Vinegar, Pepper Sauce (Peppers, Vinegar, Salt Xanthan Gum, and Benzoate of Soda [to preserve freshness]), Extractives of Paprika, Soy Lecithin, Carmel Color, Calcium Disodium EDTA (Added to Preserve Flavor).